Karen Restoule speaking to 200+ leaders at MetroNext 2018. 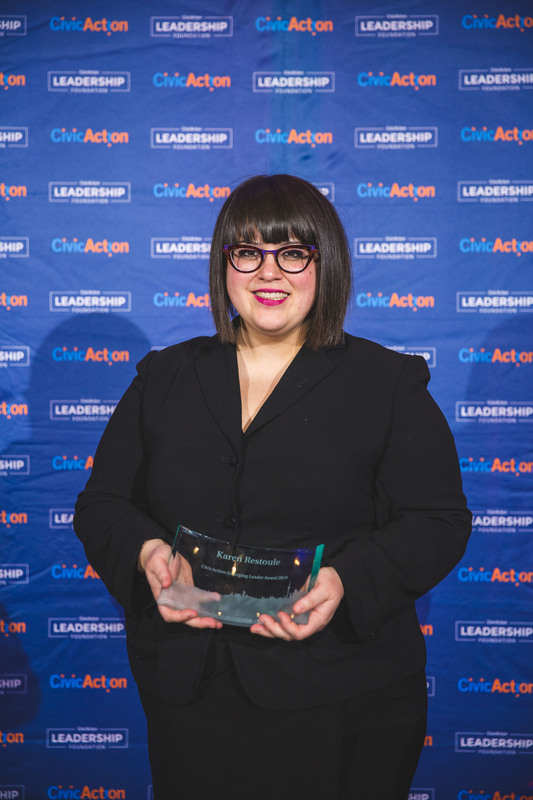 Karen Restoule is CivicAction’s 2018 Emerging Leader Award recipient. 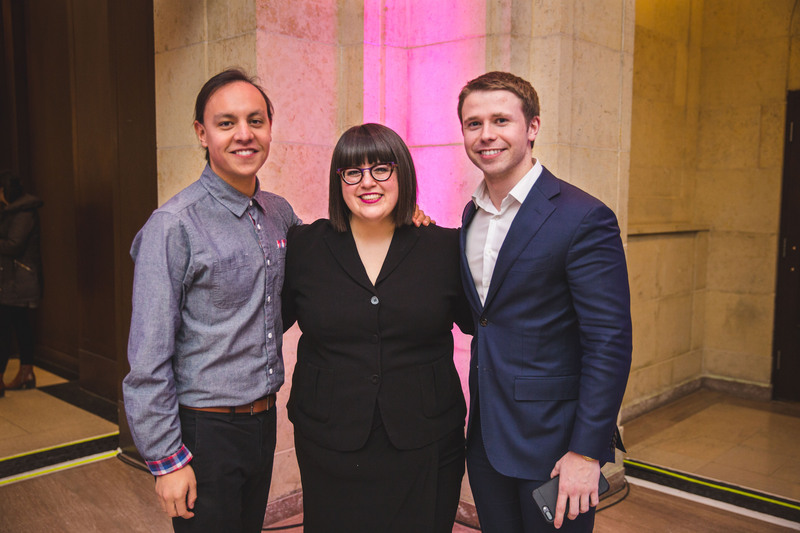 A leading convener and rising Indigenous champion, Karen was recognized for her work at MetroNext on March 23, 2018 at Union Station. For more leadership spotlights, click here. When Karen Restoule speaks of her late father Robert, it’s clear how much he meant to her. Growing up in Dokis First Nation in the ‘60s, Robert saw and experienced the effect of bad government policy designed to prescribe another way of life over Indigenous communities. Yet as Karen explains, Robert flourished as a community builder—whether it was coaching youth hockey, gathering family and friends for a fish fry, or organizing a community fundraiser. Robert’s knack for simple, honest, yet meaningful conversation is embedded in the way Karen does her work. Karen Restoule is CivicAction’s 2018 Emerging Leader Award recipient. 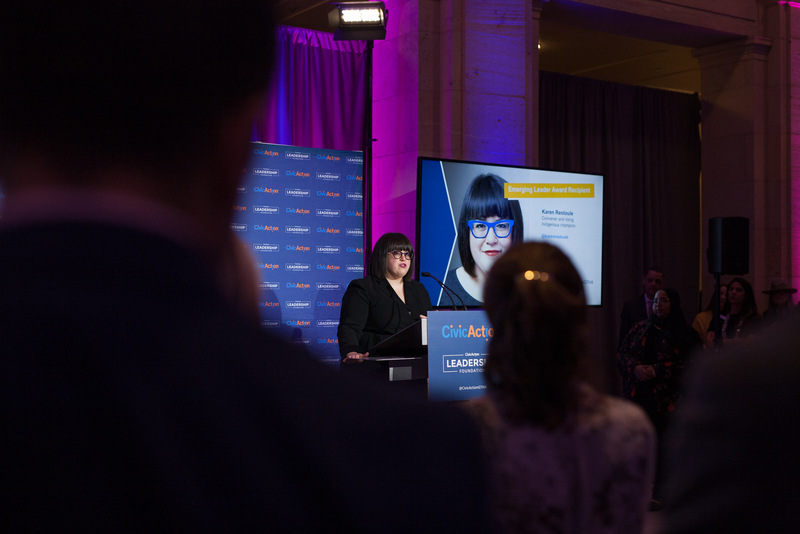 The recipient of CivicAction’s 2018 Emerging Leader Award, Karen’s approach to city-building is one that focuses on the need for humility, respect, and open mindedness in the process of reconciliation and partnership. It’s an approach she first saw while working with the city’s Aboriginal Affairs Committee in 2004, and later with Kim Murray and Jonathan Rudin at Aboriginal Legal Services of Toronto—two people she names as key mentors. These experiences have led Karen to become an expert convener and rising Indigenous champion who builds new bridges between Indigenous peoples in Canada and corporate leaders—a process in which Karen tries to strip away the preconceptions and pressure that can often surround negotiating environments. It’s this line of thinking that has helped Karen lead the development and launch of Whose Land, an app that maps the territories of Indigenous peoples in Canada; develop the Who Is She? campaign on murdered and missing Indigenous women and girls; support the negotiation of a tripartite policing agreement with 19 Indigenous Chiefs; and establish Bold Realities, a non-profit that seeks to explore the bold and innovative ways the relations between Indigenous peoples and industry can move forward. Running through all of this work is Karen’s vision for better, more inclusive communities and cities across Canada. But this same vision requires more people to listen to each other and to have the humility to admit when they don’t know something, especially when it comes to the history of Indigenous peoples, says Karen. Karen with Max FineDay and Dale McDermott. As she continues her work, Karen’s advice to emerging leaders comes from her father’s encouragement from her time playing softball. With this strong work ethic, optimistic attitude, and collaborative spirit, Karen Restoule has made her mark as a leader—and she’s not done yet.